In November, JCI The Netherlands is hosting the 2017 JCI World Congress. Will you be there? The 2017 JCI World Congress in the Netherlands will be an event people want to be part of; active members, senators, alumni, and even non members! Why? For the world class speakers, for the fantastic company visits, for the famous Dutch parties, and specifically for the JCI WE DO program. This short movie explains the theme, the pillars of their program and the reasons why you should join JCI Canada in the Netherlands on November 6-11! JCI teaches us how to be the change that the world needs. Check out this video to learn how to become an Active Citizen with JCI. Free for all members and non-members!!! 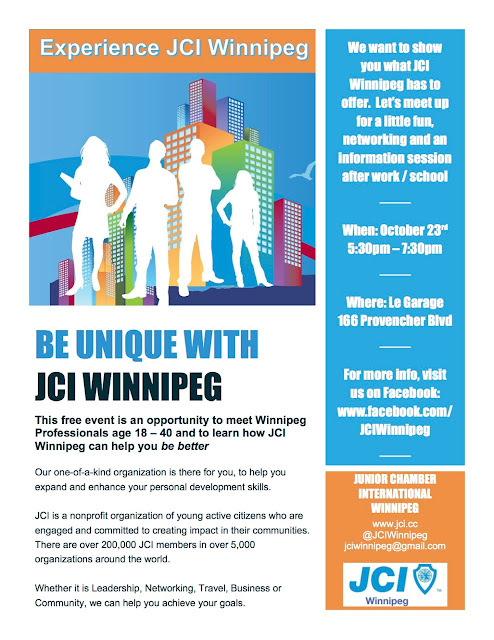 Experience Junior Chamber International (JCI) Winnipeg is our chance to show you who we are! Come mingle with current and past JCI members and experience what JCI Winnipeg is all about. With great prizes and fun people, how can you not stop by after work! JCI is a nonprofit organization of young active citizens age 18 to 40 who are engaged and committed to creating impact in their communities. Active citizens are individuals invested in the future of our world. JCI gathers active citizens from all sectors of society. We develop the skills, knowledge and understanding to make informed decisions and take action. As globally minded young people, we all have rights, responsibilities and share goals. The team at JCI Winnipeg is working hard to get ready for this year's Prairie Regional Convention where we welcome Chapters from Alberta, Saskatchewan and Manitoba for a weekend of education and fellowship. We have many fantastic speakers lines up such as Jessica Dumas of Prime Image Life Coaching and Sachit Mehra of East India Company. JCI Winnipeg is also excited to host JCI Canada National President Shawn McMillan to facilitate an Effective Leadership Workshop. This event is open to both JCI members and non-members so secure your seat today! Visit our Convention Page for all of the most up to date information. Please join us for our annual Effective Speaking Training Seminar. This is a free event to all of our JCI Winnipeg Members and only $25.00 for non-members. If you choose to become a member that day, you will save $25.00 off your annual membership fee. This is an open event for anyone wishing to upgrade your public speaking skills and network with young professionals. 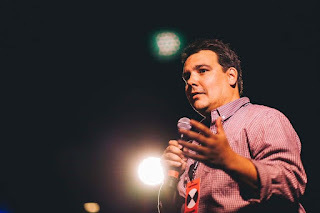 Niigaanwewidam James Sinclair is Anishinaabe (St. Peter's/Little Peguis) and an Associate Professor at the University of Manitoba. He is an award-winning writer, editor and activist who was named one of Monocle Magazine's "Canada's Top 20 Most Influential People" and one of the CBC Manitoba's "Top Forty Under Forty." He is a regular commentator on Indigenous issues on CTV, CBC, and APTN, and his written work can be found in the pages of newspapers like The Guardian and online with CBC Books: Canada Writes. His first book on Anishinaabeg literary traditions will be coming out with the University of Minnesota Press in 2017. Are you looking to make a difference in your community? See how JCI and our Active Citizen Framework can make your thoughts a reality! Join JCI Winnipeg to give back to the city that you call home. Follow our 2017 JCI Prairie Regional Convention page for information on the upcoming conference being hosted by JCI Winnipeg May 5-7, 2017.